Jason Hartman: Welcome to Holistic Survival number 10 where we are talking about protecting the people, places, and profits you care about in uncertain times. Today we have a great interview with Laurence Gonzales. He is the author of Everyday Survival and also Deep Survival. And he talks about why smart people do stupid things in survival situations. I think you’ll find this pretty interesting. Before we go to the interview, I just want to tell you that if you are interested in the profit side, remember it’s people, places, and profits, listen to the Creating Wealth show and join us when Platinum Properties Investor Network presents the Creating Wealth boot camp on November 14th here in Orange Country, California. We’d love to have you join us. For more information, go to JasonHartman.com and join us for that. Also, we’ve got a bunch of resources at JasonHartman.com website and also the HolisticSurvival.com website as well. So make sure you check those out and take advantage of them. So people, places, and profits, let’s listen into the interview with Laurence Gonzales. Jason Hartman: It’s my pleasure to welcome Laurence Gonzales to the show today. He is coming to us from Illinois and his latest book is Everyday Survival: Why Smart People Do Stupid Things. Laurence, great to have you on the show. Laurence Gonzalez: Thanks for having me. Jason Hartman: So tell us a little bit about your overall background if you would and then let’s talk about a couple of your books. Laurence Gonzalez: Well, my background is as a journalist. And my specialty in journalism over time became studying people who did dangerous things. I did a lot of work doing some dangerous things myself, and studying people who either did dangerous things or things that required extreme concentration like brain surgeon for example. And in the course of this I became very interested in what made people survive and what failures people experienced in trying to survive, and out of that grew my book Deep Survival which came out in 2003, which the subhead is Who Lives, Who Dies, and Why, which is what that book is about. And then I moved from individual survival to a larger question of our survival as a species and our survival in this world and what we’re doing globally that may affect it. And everyday survival is much more about that than about the individual. Jason Hartman: You list 12 rules for survival I believe on your website and um that’s probably in one of the books I assume as well. Can you kind of give us a review of some of those 12 rules? Laurence Gonzalez: Yes. What I did was I studied hundreds and hundreds of cases of where people had survived and what they had gone through in the course of surviving and I tried to glean the things they had in common. And this was true, whether it was somebody in a Nazi concentration camp or somebody adrift at sea or stuck on a mountaintop or whatever, and that’s where these 12 rules of survival came from which are in the book Deep Survival. And the first one is perceive and believe which means don’t engage in denial. One of the most natural traits when we get into trouble is to think oh it’s not really happen. And that wastes time and it prevents you from doing something useful. I don’t know if you want me to go through all of them or not but stay calm is the second one. As I describe in the book, reason and emotion work kind of like a seesaw. If emotion is high, you can’t really reason clearly. And if you’re reasoning clearly, it tends to dampen emotion. So keeping your emotions under control, not eliminating them, but keeping them under control helps you to think through things when you’re in trouble. This is true whether you’re talking about an emergency like falling off a boat in the middle of the ocean or getting cancer or getting a divorce, any kind of emergency that can raise emotions. Jason Hartman: Laurence, it’s really interesting that when we use the word survival, of course everybody assigns a different kind of connotation to that word, but when you address it, you really address just a huge, broad sort of concept of survival, everything from cancer to divorce to maybe a bad business deal to falling off a boat in the middle of the ocean. That’s a very broad view of survival. Laurence Gonzalez: Yes, it is. And to tell you the truth, the concept of survival which has become very popular since Deep Survival came out is a little bit of a trick. I mean because what we’re really talking about is decision making in most of these cases. Now there are other elements to it that tend to be involved without people realizing it. For example, your state of mind is extremely important, your emotional state of mind. And whether or not you feel good, for example, is a very important ingredient in succeeding in anything. And so having techniques to make yourself feel good, which sounds like a flimsy concept but it’s not, is a way to cause yourself to succeed whether you’re succeeding in business or you’re succeeding in, you know, you lost your job and you’re trying to get another job, if you’re depressed you’re gonna have a hard time of it. And so when I talk about survival, I’m talking about succeeding at making good decisions, so when I do my speaking engagements for example, a lot of what I talk about is how we make bad decisions and how we can make better decisions. Jason Hartman: And I agree with you, it’s all about making the right decisions because probably the most important element in any survival scenario is how we think and how we think of course determines how we act. Give us a couple of examples, because it’s particularly interesting. Even you acknowledge that seems like a flimsy concept of making yourself feel good. What would be a couple of methods for making yourself feel good about a tough situation. Laurence Gonzalez: Well in Deep Survival, I describe a case of a guy named Steve Callahan who was shipwrecked at sea, and he was adrift in a raft, a very small raft I might add, for 76 days. Laurence Gonzalez: Not a record, but it’s a very long time. And he had nothing really. You know he had a small survival kit and he had very little to work with, and he was constantly being besieged by problems like leaks in the raft and sharks wanting to attack him and all this different stuff which he had to battle even while trying to keep from starving to death or running out of water. So he had this method by which he…Every time he succeeded at doing one little task, he would celebrate his success by doing something like allowing himself a drink of water or a piece of fish that he had caught, and what he was doing was he was renewing his store of energy, his store of sort of personal, spiritual, emotional energy, so that he could go to the next task. And we find in the best survivors the best decision makers indeed. And what they do is they take big tasks and then they break them down into small tasks. And when they succeed at the little tasks, they reward themselves in some way and that gives them the strength to go on. Jason Hartman: So celebrating small incremental steps and small victories. Laurence Gonzalez: And you see this a lot in the corporate world. People build in incentives so that when workers do a small task correctly they get rewarded. Another element in this is how socially connected you are. People who are more socially connected tend to be better survivors. And one particular example that struck me was a fellow that was a fellow who was out in Grand Teton National Park cross-country skiing by himself in mid-winter and he broke his leg and he was miles away from where he had parked and he knew he had to get himself out on his own and he could only get out by scooting along on his bottom using his arm. Very tedious, very tedious. It took him days and days and days. And I said well how did you do it? And he said he moved in sets of 100 moves and every 100 moves he dedicated to something or someone in his life that he loved that he wanted to get back to, so his wife, his music, his sports, his family, whatever he could think of that he loved in life, and so this social connection sort of drew him along in his quest to get back. Jason Hartman: That reminds of really kind of the Victor Frankl man search for meaning type concepts where the people that survived the Holocaust, they had a reason. Whether the reason was positive, it was seeing someone you love again, or wanting to make a difference in the world, or it was even negative, you know, getting revenge against the guards, it can work either way, can’t it? Laurence Gonzalez: Well yes. There’s a famous case among search and rescue people that they referred to this, a fellow who was lost in the desert and they went out to find him, assuming they would find a body. He’d been out there six days I think, which as too long. You can’t live that long without water. Well they found him alive, and they said to him once he recovered well how did you do it? And he said well I was going through a very bad divorce and I just didn’t want her to get everything. Jason Hartman: I love that. Laurence Gonzalez: That can be a motivator too. Laurence Gonzalez: But some connection to the world will bring you back to the world. Jason Hartman: Right, right, a very good point. Socially connected people have more of a reason to survive, yeah. Laurence Gonzalez: In fact, there are scientific studies that show that people who are socially embedded in the social network tend to lend longer anyway, forget about being lost at sea, they tend to live longer and be healthier anyway. Jason Hartman: Sure, yeah. Okay, good. Tell us more. Laurence Gonzalez: And you mentioned Victor Frankl, some of the people that I studied and wrote about in Everyday Survival and Deep Survival were people in concentration camps. My father was in a Nazi prison camp as a matter of fact. And one of the things that’s surprising about them is how they find ways to appreciate what’s beautiful in the world and to feel gratitude even in the worst situations. Victor Frankl talks about this where the prisoners would come out in the evening just to watch the sunset and remark how beautiful it was. In fact, there was a great deal of art produced in the prison camps, in Auschwitz. There’s a large collection of art from Auschwitz that has made a touring exhibition at times. And there’s everything from beautiful pencil drawings to cartoons. There was one and I saw one that was actually Mickey Mouse goes to Auschwitz. It was a comic book that someone had produced in Auschwitz, one of the prisoners. Laurence Gonzalez: And this was stuff that they had to conceal. If they were caught with it, they’d be killed. So all of this art was hidden. But it gives you an idea of how the human spirit survives in extreme situations. And it’s no different if you’re going through chemotherapy for cancer or if you’re going through a terrible business climate or you lose your home or whatever befalls you, these are things that can help you. Jason Hartman: I would certainly agree with that. So you’ve got a couple of more steps here. I know we sort of haven’t covered them specifically for the last few, but I think the last one was really number 8, see the beauty, right? Laurence Gonzalez: See the beauty. Laurence Gonzalez: Yeah. And I regard survival as a a spiritual quest. One of the things that I’ve notice about people who go through these things is that they come out of it, the best of them, the ones who survive most successfully come out of it. Although you’d never wish this on yourself, they come out of it grateful for what the changes were that they brought about in their lives. I know one woman who was attacked by an 8 foot shark that basically tore her arm off. And she would have died, except her husband happened to be a trauma surgeon and he was right there on the boat when this happened and saved her life. And she was severely disabled by it. And now she’s recovered completely. She has a mechanical hand, but she talks about how it enriched her life to go through this, how she never could have been the person she is without that, and part of that comes from the ability to see the beauty when you’re in the middle of something terrible. Jason Hartman: That is amazing to me. On sort of a linear plane you think a shark bit my arm off. I almost died. I’m grateful to be alive still. But how do you see the beauty in that? I mean where’s the beauty in a shark biting your arm off? Laurence Gonzalez: You know, it’s interesting what you notice when you’re going through these things. Steve Callahan, the guy who was set adrift at sea when his boat sank and drifted for 76 days, he was covered with salt water sores. He was being attacked at every turn by sharks, he was starving to death, emaciated, and everything was breaking that was supposed to be working, and he sat in the evening, in the nighttime in his raft and looked up at the stars and just contemplated how beautiful it was and he said he felt like he had a view of heaven from a seat in hill. And there was another woman I know who was in a plane crash on top of a mountain in Sierra Nevada at about 12,000 feet and she was in a cocktail dress. She was not dressed for being in the wilderness. She was going to a party and high heels. And she had to walk down this 12,000 foot mountain, climb down. She had never done any climbing, had a broken arm, and was in terrible shape, and yet she said going through this beautiful landscape she just allowed herself to be overtaken by how marvelously beautiful it was and how lucky she was to have it all to herself. And that was her attitude. And you can call it a little crazy, but that attitude of joyous acceptance and appreciation of it sustained it for the 36 hours that she climbed down this mountain. Laurence Gonzalez: So having that ability to give yourself something joyous that helps you get through. Jason Hartman: To find the best in it and of course I’ll go back to Victor Frankl but how we choose to perceive a situation is what he called the last human freedom. Laurence Gonzalez: Yes. And there was a woman that Victor Frankl talked about who was dying, and she knew she was dying. And she had been some sort of society woman back in her original life before she was captured by the Nazis and Victor Frankl was talking to her in her last hours and she said, you know, I’m really glad this happened to me because I was really brought down off of my perch. And I never was spiritually a very deep person, but now I am and I never would have gotten here if this hadn’t happened to me. So even in her dying moment, she was grateful for the experience and how she had grown in the experience. And I know another woman who had cancer and she was going through chemotherapy and feeling sorry for herself and bemoaning her faith. And she went to the hospital to get her treatment and happened to see this ward of children who were getting chemotherapy. These were these little 5, 7, 10 year old kids who were going through chemotherapy and they were bald, they lost their hair and she said all of a sudden she realized wow, these little kids can do this. I can certainly do it. And she started devoting her time to going and being with the children and entertaining them and it completely took her out of herself. And that’s one of the points that I make over and over again about survival is that people who were best at it do it for someone else or for some higher thing outside of themselves. Jason Hartman: Yeah. I certainly agree with that. You know I’d like to ask you about number 10 specifically which is surrender. And you may not have addressed that in your work or thought much about it, but I want to ask you about Stockholm syndrome a little bit. So maybe you want to talk about surrender first, but I’m kind of particularly interested in what happens as a survival mechanism with Stockholm syndrome, because there are those who say it’s really a survival technique. Laurence Gonzalez: Yeah, I think it is. Survival by surrender is not quite that. Survival by surrender refers to our tendency to hold on too tight to what we have can work against us in a survival situation. And what we mostly want to hold onto of course is our lives. And in an extreme situation, the best survivors will say to themselves, okay, what’s the worst that can happen? Well, I might die. In fact, the situation I’m in, I probably will die for example. You know, your plane crashes on top of a mountain or you’re cast away at sea, your chances are pretty slim. And yet you say to yourself okay, I’ve accepted that, but I’m still breathing in and out, what can I do next? So you sort of surrender to the idea that you may lose, and then you commit yourself to doing whatever you can do next to continue your survival journey. And I see this happen all the times with cancer patients because they’ll be given a diagnosis and say okay, we got 6 months to live. Well some people will say oh great, I’ve got 6 months to live and I’ll be dead in 6 months. Other people will say well I may be dead in 6 months but I’m gonna just do everything I can to make sure that I live a little bit longer. And then they go on and they live 6 years instead of 6 years instead of 6 months. Laurence Gonzalez: And so we’re all gonna die at some point. We’re all gonna experience bad things in life, you know, whatever it is, the death of a loved one, illness, accident. And so the point of survival by surrender is not to focus on that bad outcome, but to accept that and let go of it, surrender to it, and then go ahead and do the next thing you can do. Laurence Gonzalez: Yeah. No, I understand what you’re saying. And the key word here is balance. Because it is balanced. You have to be an activist in your surrender. You have to really want to do the next thing. And this is what we talked about, being socially connected and so forth. You have to really want to get back to something in your life. And Frankl talked about this too. The part that surrender plays is it unburdens you of having to focus on the bad outcome. It relieves you of the burden. You say okay, well that’s out of my hand. 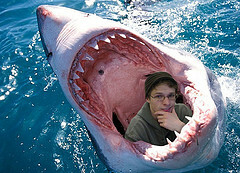 If a shark comes and eats me, well there you are, it’s over. But until that happens, I have a plan, and here’s my plan and I’m gonna do it step by step. And so it’s a slightly different approach from simply throwing up your hands. It’s a way of lessening your burden while you do your job. So it’s a little bit different approach. Jason Hartman: Right Yeah, that’s a very good distinction because when you stop focusing on it’s the end, it really relieves you of a lot of sort of psychological baggage so you can take action, right? Laurence Gonzalez: Yes. Well in deep survival, there’s another shipwrecked case where there’s five people on a raft, and two of them are guys who are not very good survivors. And they’re all screaming we’re all gonna die, we’re all gonna die, we’re all gonna die, right? And you know they’re the ones that are gonna die because that’s what they’re focusing on and in fact they do die. And so the surrender of that part takes you out of the we’re all gonna die mode and puts you into the what can I do next mode. Jason Hartman: Yeah, good distinction. What about Stockholm syndrome? Do you study that or address that at all? Laurence Gonzalez: You know, I haven’t addressed that specifically. In fact I don’t think that I wrote about a kidnapping, but in fact it does make a kind of sense because you can’t operate under constant stress all the time and there’s also a natural human tendency to connect with people. Jason Hartman: Before we go into it too much, let’s kind of give our listeners just in case there’s someone out there that doesn’t know what it is, it’s in hostage cases people are taken hostage, after a certain time period many of them kind of identify with their captors and become sympathetic to their cause which you would think is very odd. You’re being victimized by somebody, yet you would have sympathy for them. It’s sort of an odd thing. And what I heard about it recently is that is a survival mechanism because if you don’t become sympathetic to their cause, then maybe they’re more likely to kill you. That was sort of one take on it. Laurence Gonzalez: Yes, I could understand that, but I don’t think it’s quite that planned. Laurence Gonzalez: I think people who experience that are doing a couple of very natural things. Humans are social animals and they will socialize with whatever is available. And there are many survival stories that some of which I tell in my books where somebody’s lost in the wilderness, completely alone, and they start talking to the animals. People have seen the Tom Hanks movie Cast Away. Laurence Gonzalez: He starts talking to his basketball or soccer ball or whatever. Laurence Gonzalez: Wilson, yeah, Wilson, his friend. You know, that’s a classic survivor technique. And it’s perfectly normal and it’s pretty common. And if there’s a person there, you’re much more apt to engage with the person even if the person is your captor. Laurence Gonzalez: And so I think it’s a very natural thing and it’s something that people may come away feeling guilty about, but I don’t think there’s really a need to. Jason Hartman: And then your final step is of course never give up which makes perfect sense. Tell us more about the deep survival and everyday survival techniques and ideas and rules and maybe cases. I mean those cases are so interesting. You sort of surveyed a lot of people that had been through these situations and heard what they had to say after the fact, huh? Laurence Gonzalez: Yeah. One of the things that I talk about in Everyday Survival is how we have the impression that if we open our eyes and look around us we see everything that’s in the world, but that’s not how perception works. We actually make mental models of things and we store those mental models. And when we see something that looks vaguely like it, we don’t really see the thing itself. We see the mental model. So for example, if you look at a sign for handicap parking, you immediately see a person in a wheelchair. If you look at it closely, it doesn’t really look like a wheelchair or a person. It’s just a bunch of lines . But the reason we recognize it is because of this mechanism in the brain that makes mental models. So I tell this story on myself when I give talks. I was hiking in the Santa Monica mountains above Los Angeles one time and I came across the ruin of an old house, old stone collapsed house, and there was just the chimney standing up and a bunch of rubble. And I thought oh this is great, maybe I’ll find some souvenir to take home and show the kids like an old tool or something. So I started poking around in this rock ruin. Well, when I was a little kid, my grandmother had an ashtray that was a ceramic rattlesnake with its head sticking up and it was this dark, dusty color, and I really thought that was a cool thing. And as I’m poking around in this rocky ruin, I look down, and there’s my grandmother’s ashtray lying on the ground and I reached out to pick it up thinking wow, this is amazing, same kind of ashtray, and its tongue came out. Jason Hartman: It was a real snake. Laurence Gonzalez: I realized I was about to pick up a real rattlesnake sitting right there in front of me. Laurence Gonzalez: Because all these years I had stored this mental model in my head and it had these nice associations with my grandmother and that was what was stuck in my head. And yet I had no competing mental model for the dangers of rattlesnake because I had no experience with rattlesnakes. And so this thing took over my actions involuntarily at that moment. Without my thinking logically, I could have told you hey you’re in the high desert mountains where rattlesnakes are common. You’re in a rock ruin where they like to go and hunt for mice. You know, what are the chances of ever finding your grandmother’s ashtray? Which are about 0. So I knew all these things intellectually but they didn’t help me at that moment when I needed them. So we play out these scenarios all the time and we do them in very complex behaviors. In Everyday Survival, I call them behavioral scripts. But we do the same thing enough times and it becomes unconscious, like tying your shoe. You don’t have to think about it. And the system is very powerful if you think about it. If you try to teach a four year old to tie his shoe, it’s very hard to teach him. But once he learns, he never has to think about it again. So it takes something that requires all of your attention and turns it into something that requires none of your attention which is quite a feat. And people make terrible mistakes by following these behavioral scripts without thinking. Often we drive without thinking for example. Jason Hartman: Sure. Sort of the alpha state we get into where we just sort of do thing by rote and don’t even notice them anymore. Laurence Gonzalez: There’s the famous rock climber named Lynn Hill, holder of 30 international titles and she was going to climb a warm-up climb one day in France and she was tying her rope to her harness to make this little easy climb, and someone interrupted her while she was doing that and she turned and had this conversation and then she bent down and tied her shoes, went ahead and climbed. And when she got ready to repel, she leaned back and fell 72 feet because she had forgotten to tie the rope to her harness. And she lived by the way, but barely. She fell into a tree. She otherwise would have been killed. Laurence Gonzalez: And this is the top climber. This is somebody who more training could not have helped her. She is as trained as you can get. Laurence Gonzalez: And what happened was she had this behavioral script for tying a shoe and for tying a knot in her harness that were very close together. So once she tied her shoe, her brain said okay, you’re all done, you can climb now, all unconsciously of course. And this is the way we can get ourselves into real trouble through these mechanisms. Jason Hartman: And so the way to overcome that is to when you’re in a situation to be careful of what rote thinking, these scripts and really think consciously rather than letting the unconscious or sort of semi-conscious thinking take over, right? Laurence Gonzalez: Yeah. It’s called pay attention. Laurence Gonzalez: We live in a culture that encourages us not to pay attention. Everything’s done for us. Everything’s automatic and we’re always told…Basically we’re told by our culture that we’re stupid. I mean if you look at warning labels on things is my hobby, collecting warning labels. So I bought a printer for printing photographs, you know? There’s nice printers nowadays. So I bought an Epson printer and I always read the manual, not because I want to know how it works but because I want to see the warning label. Jason Hartman: A guy who actually read the manual, okay. What did the warning label say? Don’t swallow the ink? Laurence Gonzalez: It says don’t drink the ink. Jason Hartman: Are you serious? Laurence Gonzalez: Don’t drink the ink. Yes, Epson, look it up. Laurence Gonzalez: And I’m thinking so the warnings become ridiculous and we start ignoring them and basically we just take the attitude that well I can’t possibly know how my world works so I’ll just give up. And that’s part of what I was trying to do in Everyday Survival was to get people not to give up. You really can understand your world. This is an effort to understand it in a new way that will change your thinking. Jason Hartman: You know what I’d like to do kind of to wrap up here, we’ve got a few more minutes, the economy is such peril right now – I’d like to talk a little bit about survival or deep survival as you put it and business. And you’ve got some steps that you’ve outlined and some of them are sort of obvious but some I’m not sure what you mean when you talk about bending the map and seeing the Gorilla and avoid the mountainhood syndrome, etcetera. Kind of go through some of those with us because I think most people listening are really concerned about financial issues right now. And listeners to the show are concerned about what those financial issues may lead to in terms of civil unrest. Who knows what they will lead to? You know the day to day now for most people is really just financial concerns, business concerns. Laurence Gonzalez: And I wind up talking a lot about that these days. But the principals are the same. But when I refer to bending the map, I’m referring to a phenomenon where it’s a sport called orienteering where you have a very detailed map and you follow a route and it’s a sport, it’s a game. And you come to a certain place and on the map there’s a lake. And you look in front of you and you say well where is that lake? Maybe it dried up. Maybe the lake disappeared. I’m really in the right spot but the map is just showing something that’s no longer there. That’s called bending the map. If there’s a lake on the map and you don’t see the lake in front of you, that means you’re in the wrong place. That really does mean that. And so there’s a tendency, and I said this is of course what happened in this mortgage crisis that triggered the financial collapse, people were looking at a situation where a bank was saying to them I’ll give you this house for free and you really don’t have to pay for it. And your map of everything you’ve learned over your lifetime tells you well that can’t happened, that’s just a fantasy. That can never work. And yet people went for these mortgages and bought them and sure enough lost their houses, but that’s a form of building the map. Or the Madoff scandal. Bernie Madoff told all these people I’ll earn you 12%, 15% every quarter, no matter what happens in the market or the economy. Well that simply never happens and anybody who’s ever bought a stock knows that. Some things go up, some things go down. And nobody makes 12% to 15%, especially these days. Jason Hartman: So what you’re saying is that they believe something that they shouldn’t be believing just because kind of they want to? Is this like the sort of get rich quick scheme syndrome? Laurence Gonzalez: Yes, and it’s also human nature to accept the most positive evidence. Laurence Gonzalez: There’s a psychological fallacy called the confirmation bias, which means you’ll take any evidence that’s supporting your own view. If your view is I’m not really lost then you’ll come up with anything you can come up with to support that even if it’s ridiculous, like somebody moved that boulder. And so we have to be aware of these kinds of biases when we look at the world around us to avoid trouble. Celebrating the summit is another one of the things I talk about. That typical mountaineering experience is you work very hard to get up the mountain, you get up in the middle of the night so you can reach the summit in time. You finally get to the summit and wow it’s really beautiful. You take photographs. You’re slapping each other on the back and have something to eat and drink and that’s the end of the trip, right? That’s the high point. Well you’re only halfway home at that point. You’re in big trouble because you just finished your trip and yet how do you get down? Well, most accidents happen on the decent because of that, because people tell themselves it’s over, they’ve done it, they’ve succeeded, and then they become clumsy on the way down, they’re tired on the way down. And in their mind they’re saying well I finished this. Why is this such hard work? Jason Hartman: That reminds me of the Napoleon quote, the most dangerous moment comes with victory because people become complacent. So don’t become complacent is really what you’re saying there, yeah. What’s the Mountain Hood Syndrome? Laurence Gonzalez: The Mount Hood Syndrome, in Deep Survival I talk about a big accident that happened on Mount Hood where 9 climbers fell, and it basically all started with one guy at the top. He was roped to several other guys and we he slipped, he pulled his whole team off because they were roped together. And they accelerated down the mountain, collided with another roped team, pulled them off, and they accelerated down the mountain and collided with another team and pulled them off. So it took three teams in sequence and it killed I believe two people. I can’t remember the number, but several were badly injured and a couple were killed. And it resulted in this gigantic rescue effort in which a helicopter crashed. So this gigantic mess started with the slip of a foot that was like 6, 8, 12 inches of a foot slip right at the top. Part of the point of that chapter in Deep Survival is that we engage ourselves at these very complex systems that we don’t understand in which little tiny influences can wind up having huge consequences and the economy is one of those systems. When you engage yourself with a gigantic financial machine that you don’t really understand, you’re putting yourself in the middle of this and little things can have huge results and that’s where we are right now. Jason Hartman: In a highly interconnected world, that definitely happens. So it sounds like the advice there in voiding the Mount Hood syndrome is be independent as much as reasonably possible. Laurence Gonzalez: If those guys had not been roped together, all of them would not have fallen. That’s correct. But it’s also to be cognizant of the fact when you engage yourself in one of these complex, tightly coupled systems to know it, to know that you’re doing that. Jason Hartman: To realize that it’s happening, sure. Laurence Gonzalez: Yeah. And to say what safeguards am I putting in place if this whole thing goes down the mountain. And when you think about money, it’s very much a system like that. All markets experience busts and booms. You’ve got to look at them that way. We know this economy is gonna come back and it’s gonna be good again. When it does that, people are gonna start behaving just the same way they did before. And the smart people will say what am I putting in place for the next collapse because there will be another collapse. Jason Hartman: Yeah, good points. Lastly, the zen concept of the beginner’s mind in business and with money, what is that all about? Laurence Gonzalez: Well, the more experienced you get in a sense, the more dangerous you become to yourself because there is a tendency to say I really already know what’s happening here. In fact, the system of perception that I was talking about with the mental models and the behavioral scripts is designed this way. I don’t mean designed, I mean it evolved this way. It is set up so that as quickly as possible, you come to the conclusion that you know what’s happening and you respond accordingly. So hence, I reach for the rattle snake, right? I think I know what’s happening, but I’m wrong. So if you get experienced, you tend to do this more and more and more. If you are able to put that experience aside and tell yourself that you really don’t know what’s happening, then you look more carefully before you act. And the beginner looks more carefully. So for example, there are fewer accidents with student pilots than with pilots after they become students, you know, when they actually are out there, accomplished pilots. Jason Hartman: Because they’re more careful and they have a beginner’s mind. They’re afraid, yeah, right. Laurence Gonzalez: Yeah, they’re more cautious. And so being this way in our business and in our lives is a good thing. It’s a question well how much do I really know about this situation? Maybe I can get a little more information and make a better decision. Jason Hartman: Yeah, very good point. Laurence Gonzalez: You can’t fill up something that’s already full is what the zen people say. If the cup is full, you can’t add anything to it. So if you think you know anything, you’re not gonna learn anything. Jason Hartman: Yeah, I remember hearing that story about the zen instructor who was pouring the cup of tea and kept pouring it and pouring it and the cup was overflowing and the student said “Stop!” And this is like your mind. You need to empty the cup so you can receive new knowledge, right? Laurence Gonzalez: Right. Beginner’s mind. Jason Hartman: Yeah, a beginner’s mind, that’s very good. Well Laurence, what would you like to say in conclusion then, would you like people to know? And give us your website and so forth too. Laurence Gonzalez: The website, the easiest one to remember is DeepSurvival.com and there’s also LaurenceGonzalez.com, but if you Google either one you’ll find it immediately. And as I mentioned I think before we started, I have a new novel coming out from Knopf in the spring of 2010 and so that’s very exciting and I’ve just been very gratified to see the response I’ve gotten to these books. Jason Hartman: Yeah, excellent. So most of your books are nonfiction and you’re doing a novel. I know you haven’t done one in quite a while you said and that’s coming out next year. What’s the title of the novel? Laurence Gonzalez: The title is Lucy from Alfred A. Knopf. Jason Hartman: Okay. And do you want to give a brief description of that? Laurence Gonzalez: Lucy is a story of a person who is a hybrid between a human and an ape and it’s shaping up to be a very explosive controversial book, as well as an exciting read. Jason Hartman: Fascinating stuff. Well Laurence Gonzales, thanks for joining us today. The website is DeepSurvival.com and we appreciate your insights into survival of all types and how we need to use our mind and psychology in these tough situations. I appreciate it. Laurence Gonzalez: Thanks very much for having me. Holistic Survival Show #2 – Are You Prepared for Disaster?